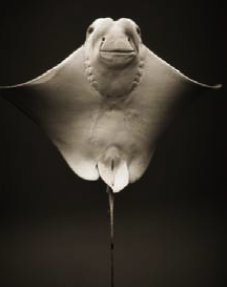 Cownose rays are actually being actively promoted as a new, “sustainable” seafood in the US, particularly in Virginia. A campaign called “Eat a Ray, Save the Bay” plays upon disputed claims that this species is preying dangerously on oysters and encourages consumers to help reduce this “nuisance” population. As a result, cownose rays are showing up on menus along the east coast and were on offer at last month’s Boston Seafood Show. Currently, there are no cownose ray fishing limits or estimates on safe catch levels. This new exhibit promises to improve public appreciation of this increasingly maligned species, a helpful component in building truly sustainable fisheries.